For the American academic administrator, see Gary L. Rhodes. For the American writer, filmmaker and film historian, see Gary D. Rhodes. 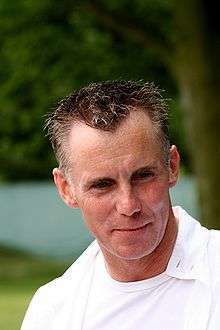 Gary Rhodes OBE (born 22 April 1960) is an English restaurateur and television chef, known for his love of British cuisine and the distinctive spiked hair style that he once wore. As well as owning four restaurants, Rhodes also has his own line of cookware and bread mixes. Rhodes can now be seen on the new ITV1 programme Saturday Cooks, as well as the UKTV Food show Local Food Hero and in television adverts for Flora margarine, some of which featured him "driving a van topped with a giant styrofoam crumpet" which were banned. Born in south London in 1960, his family moved to Gillingham where he went to The Howard School for Boys in Rainham, Kent. He then went on to catering college in Thanet where he met his wife Jennie. His first job was at the Amsterdam Hilton Hotel. He was hit by a transit van in Amsterdam leaving him with serious injuries. He then toured Europe in various jobs before becoming sous chef at the Reform Club, Pall Mall and then on to the Capital Hotel in Knightsbridge, earning it a Michelin Star in 2001. Rhodes achieved the prestigious Head Chef position at the Castle Hotel, Taunton in Somerset. He retained the hotel's Michelin star, at just 26 years of age. In 1990 Rhodes returned to London with his family to become Head Chef at the Greenhouse Restaurant in Mayfair. The menu became known for reviving British classics, including faggots, fish cakes, braised oxtails and bread and butter pudding. He was awarded a Michelin star for the Greenhouse in January 1996. In 1997 he opened his first restaurant City Rhodes, and in 1997 Rhodes in the Square – both with global contract catering company Sodexho. This partnership expanded into the brasseries of Rhodes and Co in Manchester, Edinburgh and Crawley. Based primarily at Rhodes Twenty Four in one of London's tallest buildings, Tower 42, Gary also owns Arcadian Rhodes on the P&O superliner Arcadia, Cumberland Rhodes, and Rhodes Calabash, in Grenada. He is also a contributor to BBC Good Food magazine. His first TV appearance was at the age of 27, courtesy of Glynn Christian on Hot Chefs. This led to Rhodes Around Britain and Gary's Perfect Christmas. For two seasons, 2000 and 2001, Rhodes hosted the original MasterChef USA on PBS. Rhodes ran a TV series New British Classics reintroducing classic British cuisine, and published a book of the same name. Rhodes has appeared on the BBC2 spoof game show Shooting Stars, during which hosts Vic Reeves and Bob Mortimer asked him to 'represent fire through the medium of dance'. He was created an Officer of the Order of the British Empire (OBE) on 17 June 2006. Rhodes has recently completed the series Rhodes Across India with apprentices Bushra Akram, Scott Davis and Kalwant Sahota. 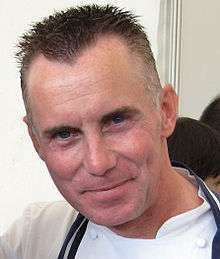 Gary Rhodes was strongly criticised for his commercial tie in with Tate & Lyle in the late 1990s, and his recipes endorsed sugar and treacle products accordingly. His name was strategically printed on every Tate & Lyle sugar sachet across the country. Rhodes is now associated with a Cooking in Schools campaign with Flora UK. Rhodes competed, with partner Karen Hardy, in the sixth series of Strictly Come Dancing which began on 20 September 2008. On 5 October 2008, Rhodes was voted off Strictly Come Dancing. Rhodes at the Dome, Plymouth Hoe, Plymouth. ↑ The London Gazette: no. 58014. p. 10. 17 June 2006. ↑ Hayward, Tim (25 February 2009). "Rhodes to perdition". The Guardian. London. Retrieved 3 May 2010. ↑ Sven-Erik Bergh, ed. (1993). Bergh's International Annual Digest of Gastronomy '93/94: All About Cookery and Wine. Bergh Publishing Group. p. 105. ISBN 978-0-930267-37-7. ↑ "Gary Rhodes' New British Classics". British Broadcasting Corporation. Retrieved 6 February 2016. ↑ "Gary Rhodes: New British Classics". BBC. Retrieved 6 February 2016.